Ever since I found out that the owner of ATV is our great leader Meles Zenawi's cousin from Adwa, I have been watching his videos religiously. It is so nice to know that ATV has become the voice of our voiceless TPLF leaders confined in Mekelle. Topic: WE WILL NEVER FORGET! Re: WE WILL NEVER FORGET! We will ask to use article 39 after we remove the tyrant Issayas from power and get our Massawa and Assab ports back to Tigrai. That is the plan. Lets work together to remove the ugum shabo from Eritrea. I am doing my part. Are you doing yours? General Seare is not from Adwa. He is from ugum agame. We Digital Weyane don't care about him. He is from the low class people in Tigrai we call the untouchables. ዮቀን ጅብ ማን ነው?? ኡኛ ዴሞክራስያውያን ወያኔ ወይስ ለምስኪንዋ አገሬ ትግራይ ነፃነትዋ ኡንዳትቀዳጅ ቹግር ዮሆኑባት ዕጉም ሻቦ??? We are the world and we are the children and we are not shocked. Stop exaggerating, Wesf'attam! Topic: Agame(Tegaru) who are in this forum.Game is over! Re: Agame(Tegaru) who are in this forum.Game is over! The game is not over until hell freezes over, or until my Awash River runs dry! I am a proud Digital Weyane from the democratic republic of greater Tigray and I'm not fed up with my TPLF visionary leaders. I spent the last 9 years defending my TPLF leaders on this forum, and I will continue to do so until the day I die. Topic: Danakali Releases 2018 Annual Report. Re: Danakali Releases 2018 Annual Report. Stop torturing me with the good news. I may be a Digital Weyane but I have feelings too. If you don't stop posting good news about Eritrea, I will retaliate by posting about Italian colonization to torture you ugum shabo!! They chose death in the Red Sea than enjoying the robust democracy in our country Tigrai. 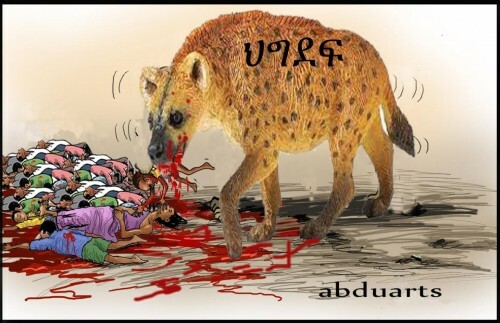 We TPLF human rights activists from Adwa cannot defend their actions that led to their deaths. The gullible people fleeing to Yemen are from Tembien and Enderta. We Adwa people love our TPLF democratic government and we don't leave our beloved country Tigrai.